An artist's rendering of a game of tic-tac-toe played with DNA tiles. 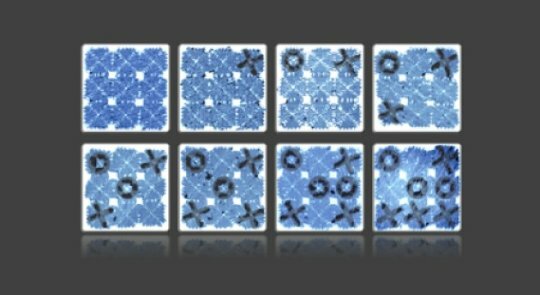 It was just about a year ago that Caltech scientists in the laboratory of Lulu Qian, assistant professor of bioengineering, announced they had used a technique known as DNA origami to create tiles that could be designed to self-assemble into larger nanostructures that carry predesigned patterns. They chose to make the world's smallest version of the iconic Mona Lisa. The feat was impressive, but the technique had a limitation similar to that of Leonardo da Vinci's oil paints: Once the image was created, it could not easily be changed. Now, the Caltech team has made another leap forward with the technology. They have created new tiles that are more dynamic, allowing the researchers to reshape already-built DNA structures. When Caltech's Paul Rothemund (BS '94) pioneered DNA origami more than a decade ago, he used the technique to build a smiley face. Qian's team can now turn that smile into a frown, and then, if they want, turn that frown upside down. And they have gone even further, fashioning a microscopic game of tic-tac-toe in which players place their X's and O's by adding special DNA tiles to the board. "We developed a mechanism to program the dynamic interactions between complex DNA nanostructures," says Qian. "Using this mechanism, we created the world's smallest game board for playing tic-tac-toe, where every move involves molecular self-reconfiguration for swapping in and out hundreds of DNA strands at once." Putting the Pieces Together That swapping mechanism combines two previously developed DNA nanotechnologies. It uses the building blocks from one and the general concept from the other: self-assembling tiles, which were used to create the tiny Mona Lisa; and strand displacement, which has been used by Qian's team to build DNA robots. Both technologies make use of DNA's ability to be programmed through the arrangement of its molecules. Each strand of DNA consists of a backbone and four types of molecules known as bases. These bases -- adenine, guanine, cytosine, and thymine, abbreviated as A, T, C, and G -- can be arranged in any order, with the order representing information that can be used by cells, or in this case by engineered nanomachines. The second property of DNA that makes it useful for building nanostructures is that the A, T, C, and G bases have a natural tendency to pair up with their counterparts. The A base pairs with T, and C pairs with G. By extension, any sequence of bases will want to pair up with a complementary sequence. For example, ATTAGCA will want to pair up with TAATCGT. However, a sequence can also pair up with a partially matching sequence. If ATTAGCA and TAATACC were put together, their ATTA and TAAT portions would pair up, and the nonmatching portions would dangle off the ends. The more closely two strands complement each other, the more attracted they are to each other, and the more strongly they bond. To picture what happens in strand displacement, imagine two people who are dating and have several things in common. Amy likes dogs, hiking, movies, and going to the beach. Adam likes dogs, hiking, and wine tasting. They bond over their shared interest in dogs and hiking. Then another person comes into the picture. Eddie happens to like dogs, hiking, movies, and bowling. Amy realizes she has three things in common with Eddie, and only two in common with Adam. Amy and Eddie find themselves strongly attracted to each other, and Adam gets dumped -- like a displaced DNA strand. Eddie and Amy have more in common and their bond is stronger. As in DNA strand displacement, Amy leaves with Eddie The other technology, self-assembling tiles, is more straightforward to explain. Essentially, the tiles, though all square in shape, are designed to behave like the pieces of a jigsaw puzzle. Each tile has its own place in the assembled picture, and it only fits in that spot. In creating their new technology, Qian's team imbued self-assembling tiles with displacement abilities. The result is tiles that can find their designated spot in a structure and then kick out the tile that already occupies that position. Whereas Eddie merely bonded with one person, causing another to be kicked to the curb, the tiles are more like an adopted child who connects so strongly with a new family that they take the title of "favorite" away from biological offspring. "In this work, we invented the mechanism of tile displacement, which follows the abstract principle of strand displacement but occurs at a larger scale between DNA origami structures," says Qian's former graduate student Philip Petersen (PhD '18), lead author of the study. "This is the first mechanism that can be used to program dynamic behaviors in systems of multiple interacting DNA origami structures."